well, i'm about to tell you how to make your DECOR reflect ART. creating vignettes / displays in your home is fun. it's inspiring. it's like playtime when you think spatially and visually. but to some people, it's frustrating. "i can't do that - i don't know how to arrange things"
well, let me tell you what - i've got a simple solution for you: you can cheat! go to Google images and search 'still life paintings'. images will pop up and you will see all kinds of inspiring compositions by master painters. just find one you like, and copy what you see in it. *there is height on the left in the standing blue delft plate, which coordinates with all of the other dishes used in the setting. *the medium height of the large melon on the right balances the standing plate. 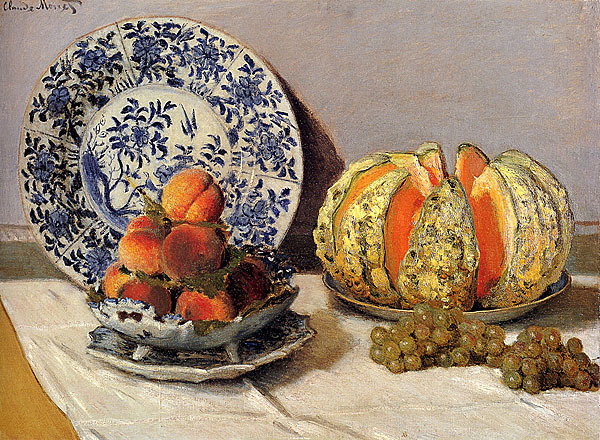 in front of the plate, there is a stack of peaches - in the same orange color and round shape as the melon. *grapes in the foreground 'break' the edge of the composition - everything else is on a plate, very contained. the grapes are 'escaping' and lead our eye out of the frame. *notice where 'soft' flowers or food are in relation to the 'hard' books/plates, etc. and then copy the way the items are assembled and arranged. this is how we learn - in art class, anyway. look at the masters, see how they do it, and do it that way. so that Claude Monet masterpiece up there could easily be replicated on YOUR mantel! you'd still have the same shapes and color palette as he did, to get the same effect. and you've become a master artist! "ok", you say - "but what do i USE in MY composition?" that's easy. i collect pumpkins, and you can see some of the ceramic ones on the mantel above. maybe you collect art glass, or BOOKS, or crowns, or hats... ??? fill vases with fall leaves & flowers, stack mini pumpkins on glass plates or bowls. lean a plate against the wall and place a small pumpkin in front of it. *select books with covers that either coordinate with or contrast the colors of fall. to mix with gold, persimmon, rust, and brown leaves. stack them, line them up, mix them in a vignette with some leaves and pumpkins for fall. if you have some great fall TITLES, or cover art, make sure you highlight those by showing them off. and dining table displays. then perch your crown or hat collection on TOP of the pumpkins. this little bit of whimsy will spark up your decor in no time! [i love the look of white pumpkins wearing a black top hat and a black eye mask. by filling them with interesting textures and shapes of leaves and grasses. go get inspired by the masters, and create your own decorative 'art'! What a great solution! I hear that from clients all the time that they just can't arrange things. I'm going to refer them to your mini-tutorial. Thanks for the art class Deb! I really struggle with this and often get frustrated...I need you to write a book please!! BTW, I got my sweet little pumpkin on Sat and am in LOVE!!! I'll be giving you a shout-out on my next blog post!!! I love you to pieces!!! You are a decorating and pumpkin making Rock Star!! Keep up the wonderful work...I hang on every word! Oh, and I love the way you mix up the fonts and throw in a little pumpkin color here and there! Thank you so much, ladies - I really appreciate your feedback. I've spent a lot of time in art classes (taught a few, too!) and discovered that there is a lot of wisdom in art!